For Jeremy Seewer, a last lap pass for second place on title rival Pauls Jonass really looked like changing the momentum of the MX2 championship but then some unfortunate incidents in race two robbed him of the chance to push home that advantage even more. Bas Vaessen returned from his collarbone injury and put in two solid races, that could have been even better were it not for his lack of bike time over the last six weeks. Hunter Lawrence also showed great speed to come through the field in both motos but was one of the riders caught out by this track, dropping him down the field after a nasty crash on the big step-down jump. Finally in the EMX250 class, Zach Pichon didn’t get an opportunity to improve upon Saturday’s first moto seventh place as he was knocked to the ground in the first corner of the second race, breaking his collarbone in the process. 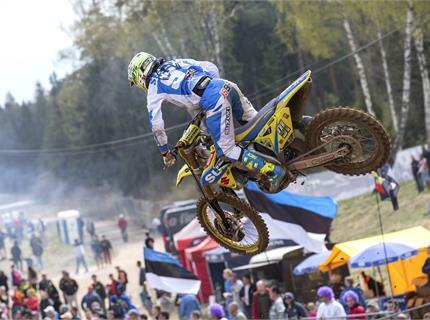 Overall it was a tough day for the RM-Z250 riders but one which they will no doubt overcome in the next rounds of their respective championships.